Luminar is a real-time photo editing program that takes advantage of modern technology and is tailored for your convenience. 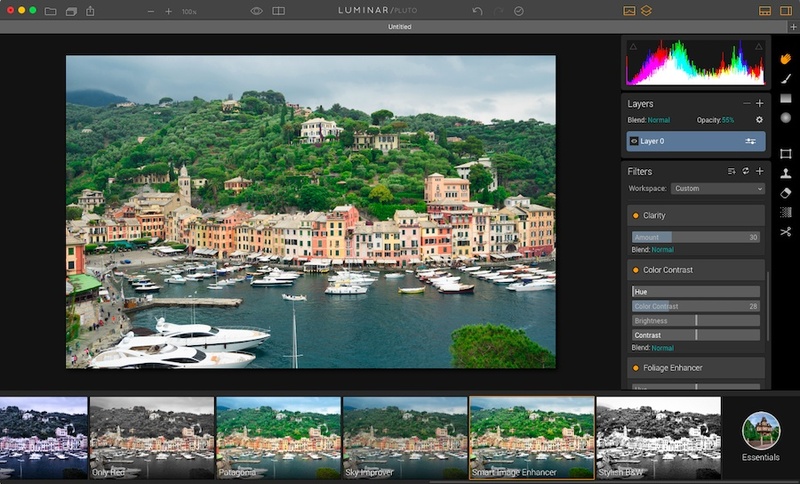 Luminar starts with a friendly interface, which feels new but is at the same time easy and inviting. All tools are logically grouped into toolbars and are always at hand. Luminar is shaped to be adaptive and customizable - add filters, group them in workspaces, save presets and let your style reflect in your workflow. Luminar is joining fundamental and innovative technology together to make basic and advanced tools equally easy to use. - Essential photo editing tools revised: noise reduction, objects removal, clone&stamp, crop and transform. - Layers, masking and blending modes. - Over 35 powerful filters for working with color, tone, structure, etc. - Unique photo enhancement algorithms enable fast and dramatic improvements. A program not only to edit and retouch photos. The program can show all you pictures as Thumbnails. It supports many picture file formats and TWAIN scanners. You can manipulate the picture with many effect filters. This is software to create Montage composite images from various out of focus images.Various microscope or camera images, taken with a different focal plane can be combined into one perfectly in-focus picture.